CommunSENS is a software system that is based on the human communication cycle in order to accumulate knowledge on a computer. Its architecture is shaped by the structure of natural language and universal data storage. The software is fully scalable. For personal use, CommunSENS is freely available. The next figure summarizes the architecture of the communication cycle. Observation: Most of the (declarative) knowledge people acquire in their youth and apply in their ordinary life is not devised by themselves but fabricated by wise men in past and present. This knowledge is transferred by means of communication. Purpose: To build a knowledge engine that can be a node in the human communication cycle. It will take some time, but one day people will talk to computers in their own language in a way that resembles human communication. To be prepared for that moment the communication cycle of CommunSENS is based on natural language. Although it is still a simple language, it can grow. At this moment substantial pieces of declarative code can be understand by people with no programmer skills. In order to define knowledge, simple sentences are used. CommunSENS has a formal understanding of the meaning of these sentences, For that reason they are used to generate (a part of) the user interface. This generation results in a visual presentation of the sentences as forms with components. The logical navigation within forms and components is generated too. 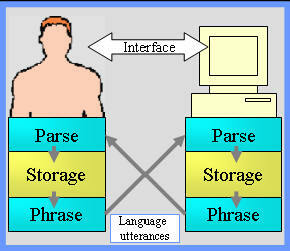 The architecture of conventional database systems (tables, keys) depends on contents. The storage structure of a medical system will differ from that of a bookkeeping system. In contrast, humans are able to store all kinds of knowledge in their brain without bothering about its specific structure. In a similar way CommunSENS is equipped with a universal database that behaves as a semantic network. It has an architecture that is independent of the knowledge it has to store. If a computer system will ever become a full partner in the human communication cycle, it should be able to talk about the same topics as humans. Most of the time these topics will be elements of every day life. They can be understood by applying conventional logic (proposition and first order predicate logic). However, humans also have much more abstract capabilities. For example, they can think about how they think. To process such complex constructions, higher order predicate logic is needed. The logic that is applied in CommunSENS can handle these kind of self referring mechanisms. This feature makes CommunSENS applications fully scalable: they can be build and updated while they are running. This scalability of knowledge one also finds in humans. People can learn new things or can update their existing knowledge 'at run time'. We do not rebuild our selves in order to acquire new knowledge or skills: we just add and modify it. In contrast, conventional computer applications must be rebuild if their knowledge structure and state fundamentally changes. The added value of CommunSENS is this: it allows for variable knowledge on a computer, at all kinds of levels, at run time.. There are three ways to proceed. The preferred way is to download the software. After installation start the system and follow the instructions of the tutorial. The tutorial has some relevant links to this website . If you just want a glance of the look and feel of the knowledge engine browse chapter 3 Engine. If you want a glimpse of some CommunSENS applications, browse through the chapters 4 (small application) and 5 (heavy application). If you are interested in the overall picture, just proceed. 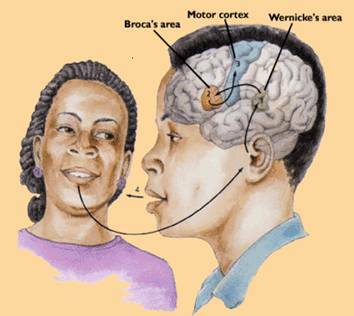 1 The communication cycle The classic physiology of the communication cycle is discussed. Roughly based on this physiology the main architecture of the knowledge engine is presented. This architecture is compared with today's use of computers. It will be pointed out in which fields this architecture has added value. - a formal natural language (Fonal). Knowledge is expressed in simple sentences. - a generated input interface. - procedural: a small DLL that represents the working of the communication cycle. It does not have any contents. This part is not scalable. - declarative: the semantic network contains all data. Any application that is build with the engine is stored as data. For that reason you can update such an application while it is running. With the exception of the stored language, this part is fully scalable. Because CommunSENS it self is build by the engine, you can redesign the system as well. •- the definitions in simple declarative sentences and instances. After parsing the sentences, the application is running. •The EU-Rent application is linked to a taxonomy, a general description of the world. 6 Download You are invited to download the knowledge engine and try for your self. After downloading and running the engine you will enter the tutorial. If you follow the instructions of the tutorial you will get a good impression of the engine. 7 Notes This section contains notes about some technical aspects. their contents requires the advance permission of AB Ontwikkeling BV.